My friend Stephanie, who has been popping up frequently in my N&R columns, has recently accepted the position of Director of the Greensboro Children’s Museum Edible Schoolyard!! I’ll miss beeping her through our inter-office phone system but I’m thrilled to work with her at the Schoolyard.What an exciting and honorable position. I had some of our mutual former and current office girlfriends over on Thursday night for a celebratory “whine and wine.” I’m typically not one for a potluck but the season is hectic and I asked everyone to bring a snack. I’m so glad I did because everything was delicious. 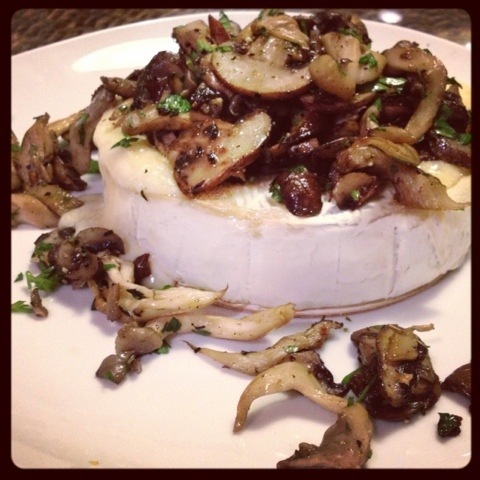 I made a very quick baked brie and topped it with sauteed cremini and chanterelle mushrooms. Served it with a baguette from Loaf in Downtown Greensboro and plenty of wine. This was delicious and easy – I made it in less than 30 minutes and it was hot when everyone arrived. Keep this in your side pocket for last minute celebrations. Heat oven to 375 degrees. Unwrap the brie, discard the top of the wooden container and slice off a thin layer of the cheese. Put the cheese bake into the bottom part of the wooden container. Bake on a cookie sheet in the oven for about 20 minutes or until bubbling. Meanwhile, slice the cremini mushrooms and tear the chanterelle mushrooms until small pieces. Sauté in a skillet with a mix of butter and olive oil. One beginning to brown, add the garlic and season with salt and pepper to taste. Remove the cheese from the oven – if you can peal off the side of the container – and top with mushroom mixture. Serve with crackers or bread.